These teachings from Spirit come from my inner meditations which, in the tradition that I follow, is called shamanic journeying. This teaching and information came in spontaneous journey while I was teaching a class as a shamanic practitioner. I was grateful at the time to be able to share the message in the journey. This group has been a part of participating in the teachings and practices that have come from this inner vision. In these teachings I am told that they are from the “Buffalo Winds” and my teacher is from the ancient Sedona Buttes of the Red Rock Canyon in Sedona, AZ. It was in Sedona, at Red Rock Canyon, where I received my first gift from Spirit giving me the first sign that I would one day walk the shamanic healer’s path. I had no idea at the time of the significance of this event. It is heartwarming that spirit/Spirit brings me back to these origins and remembering. This ancient Native American chief calls himself “Chief Wind in His Shoes” and he traveled from the long ago past to deliver teachings through me to the group I was teaching and to a wider audience. This truly is the heart of the teachings from Chief Wind in His Shoes. Yes, I totally understand how that sounds. 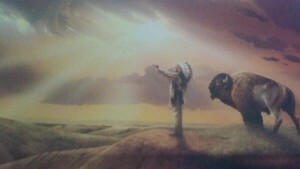 In my shamanic personal practice I have always begged off from toting or giving credence to spirit names. The whole idea of it makes me want to throw my hands up in the air and say, “Really? You expect me to take you seriously now?” But, I am choosing to put this question down, and to trust that there is an important message and teaching being given to me to share with others. As an actress I learned to “drop the fourth wall” meaning that I included the audience in the tale being told on stage with an invitation to know that we are imagining all together. This is what I am inviting you to do with me…to drop the fourth wall and imagine that perhaps there are those in spirit/Spirit who whisper inspiration, truth, and teachings to us. So, together, through this series of journey teachings we will follow on the heels of Chief Wind in His Shoes and keep our eye rolling to a minimum as best as possible. My spontaneous journey begins with me traveling back in time swiftly. I feel like I am traveling into the distant past and when the traveling is over I find myself on sand and standing at the base of red buttes in Sedona, AZ. I am at the base of one butte in Red Rock Canyon where there are cave drawings and a place, up high on the butte, where medicine men from the past and the present hold ceremony and commune with Great Spirit. I see a chief medicine man sitting in this opening or shallow cave burning sage and a small fire. He calls me to sit by his fire with him. I join him and ask him his name and why he has called me into his presence. He responds with the following teachings. Chief Wind in His Shoes tells me, in my journey, that the ancients looked to the future for insight, answers, knowing, and prophesies of what was to come and for finding wisdom and guidance. Contemporary man is now gazing and looking backwards to the ancients and their knowledge, their wisdom and their spiritual practice that is deeply rooted in their relationship to the stars and to Mother Earth. I have called you back in time to bring teachings for your time that are needed. In my journey I see a “river of people” and I see them all in black and white. It is an image of us, of humans, living their life and in the flow of living. The image is in black and white which means that something is not in balance; that something is missing. I ask chief what the meaning of this image is in the journey. This chief tells me, “It is Mother Earth that gives you color.” Many do not know they are living a life in black and white. This is living life without relationship to Mother Earth. When you spend time in nature you become like a little child. Step out of your house, your office, your car and once a week, or more, be in nature for 1 to 2 hours. Make it a substantial amount of time. In this way you begin again to live on and with the earth. Be in and of nature, your natural home…your natural place. Go for a hike or to a park or out into your backyard or walk your neighborhood or to an outdoor activity. Look at the trees and see who lives in them. Look to the ground and see what crawls there. What are the plants doing around you? Listen close and one might call to you, introduce themselves to you…speaking to and through your heart. Nature is alive around you and recognized or unrecognized is in relationship to you. Bring cornmeal with you or cinnamon sticks or apple slices. Leave it as a gift of gratitude at the base of a tree or some other wonderful place as a way of recognizing this relationship and how it contributes to your life. Begin to see the cycles in nature, the relationships and doings of the animals that live near you in these places. Notice all of it. It is important. This is a new way of seeing. This is seeing wholly. In this way we begin to explore and experience a relationship with nature and the animals. In this way we fall in love with Mother Earth again and in this falling in love we dedicate ourselves in a new and personal way to contributing to the highest vision we have of the Earth and our place in it and our children’s place in it and the animals and trees and plant’s places in it. But most importantly we step into our right relationship with nature and become a part of it in a real and meaningful way…through our heart and a deeper seeing of all the life around us and how we are part of this. You and me, we are co-creators and we are participating in a planetary transformation that is happening right now. What is your vision for the future of our world, planet, and the inhabitants of this blue marble? Design this vision and write it down, make art of it, write a poem about it, share your vision with your child/children, loved ones, and/or friends. Make a quote of it and post it on Facebook so it moves into the world and goes forward. Dream the world into being…dream the highest vision of Mother Earth. See yourself living in this amazing world you have envisioned! Go outdoors, observe, notice the life and cycles there, bring gratitude in gifts or in the heart or both! What is your vision for the world? Design this vision and put it into form (writing, song, poem, art, and/or a Facebook post. Share your vision with others. Share your thoughts and experience here on this blog, or Facebook page, or wherever you came across this article. Buffalo Winds: The buffalo was such a huge part of Native American life. The buffalo plays a role here in these teachings. As a power animal the spiritual meaning/qualities of buffalo is as follows: manifesting, protection, earth creativity, feminine courage, knowledge, abundance, generosity, sharing work, survival, giving for the greater good and formulating beneficial plans.